First off, thanks so much to everyone who came out to our Christmas in Mimico event. It was an amazing afternoon filled with beautiful songs and community spirit! Huge thanks to the kids who worked so hard and sang so mightily so that we could all enjoy the fruits of their labour. And a special thanks to anyone who volunteered their time and/or donated at the event – it is only thanks to you that we can continue giving our kids the gift of music! This week we will be going over to the Rec Room, where we will be performing some songs as a way of thanking them for their generous sponsorship. Please have your chorister wear or bring his/her choir shirt so that we can give the Rec Room kids the full experience 🙂 After our performance, we will be returning to the Mimico Baptist Church for a bit of a party to celebrate all of the kids’ hard work this year. We’ll be partying late into the night…by which I mean, please come around 5 or 5:15 to grab your chorister so that they can take some time to par-tay. 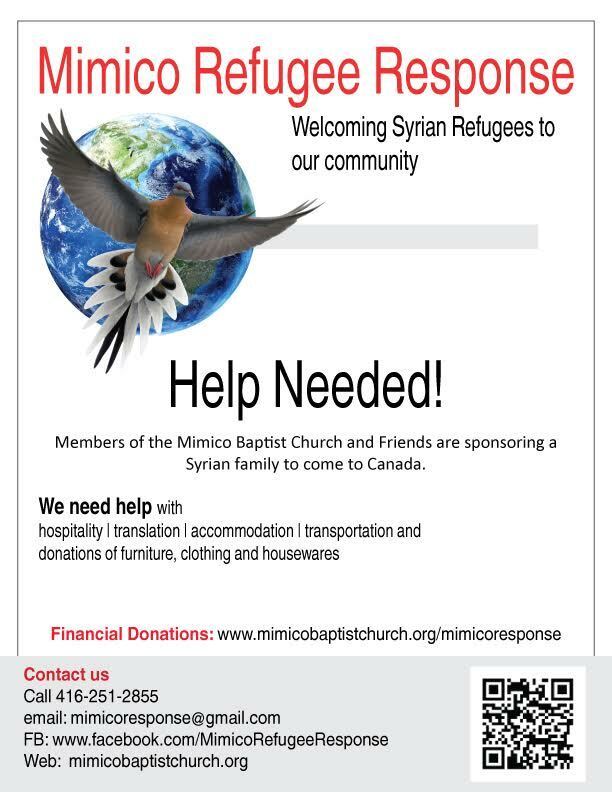 Finally, as you heard at Sunday’s concert, the Mimico Baptist Church is managing the Mimico Refugee Response, with the goal of sponsoring a Syrian refugee family so that we can welcome them to our community. They are looking for donations of all kinds. Please take a look at the attached flyer for more information, and give what you can if you are able.